Home » appalachia , culture , good times , maggie valley , moonshine , moonshiners , music , north carolina , popcorn sutton , popcorn sutton acoustic jam » The 3rd Annual Popcorn Sutton Acoustic Jam begins TODAY! 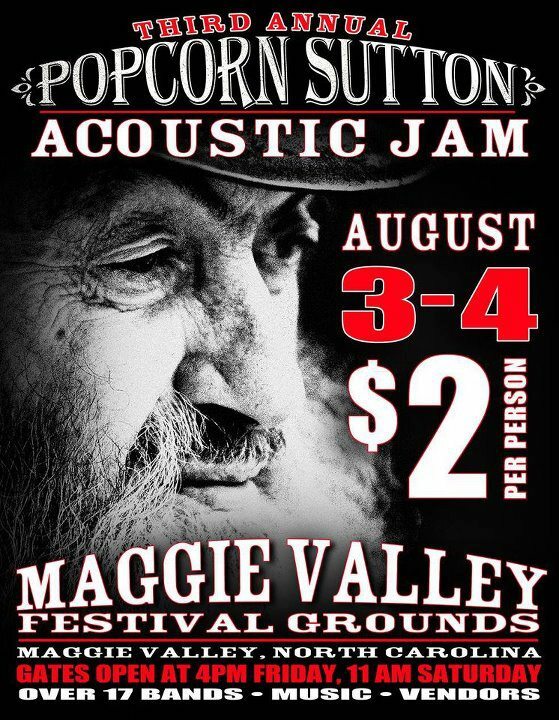 The 3rd Annual Popcorn Sutton Acoustic Jam begins TODAY! It started as one evening's tribute in music and song of the memory of legendary moonshiner Marvin "Popcorn" Sutton. Last year it became a full-blown event that had to be moved to the Maggie Valley Festival Grounds, practically at the last minute because there was so much interest. And this year, it's gonna be even bigger! The 3rd Annual Popcorn Sutton Acoustic Jam kicks off this afternoon at 4 p.m. in Maggie Valley, North Carolina (about 40 minutes west of Asheville). At least fifteen bands will be performing country, bluegrass, a bit of everything in between. There will be tons of food and drink ("...but will there be moonshine?! "), merchandise for sale, loads more. Unfortunately I will not be able to attend this year's festivities because of something else that I have to attend to this weekend. But I was at last year's Popcorn Sutton Acoustic Jam and had a rollickin' great time! It's only two dollars for admission. I can not recommend enough attending this event if you can at all make it to Maggie Valley this weekend! Here's the event's official Facebook page. Click on over for more information.